The sucrose non-fermenting-1-related protein kinase 2 family (SnRK2s) unifies different abiotic stress signals in plants. To date, the functions of two rice SnRK2s, osmotic stress/ABA-activated protein kinase 1 (SAPK1) and SAPK2, have been unknown. We investigated their roles in response to salt stress by generating loss-of-function lines using the CRISPR/Cas9 system and by overexpressing these proteins in transgenic rice plants. Expression profiling revealed that SAPK1 and SAPK2 expression were strongly induced by drought, NaCl, and PEG treatment, but not by ABA. SAPK2 expression was highest in the leaves, followed by the roots, whereas SAPK1 was highest expressed in roots followed by leaves. Both proteins were localized to the nucleus and the cytoplasm. 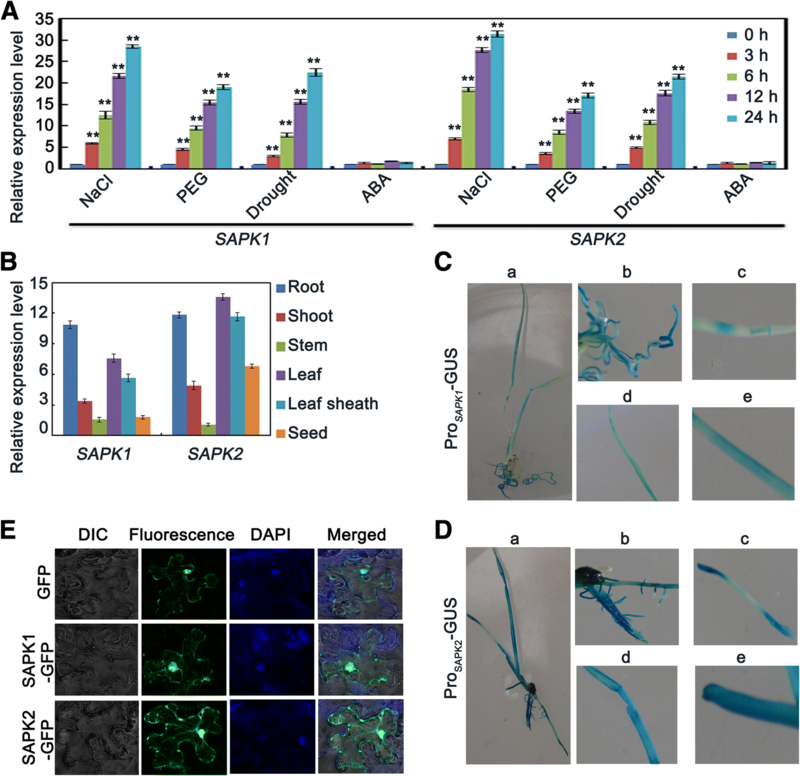 Under salt stress, sapk1, sapk2 and, in particular, sapk1/2 mutants, exhibited reduced germination rates, more severe growth inhibition, more distinct chlorosis, reduced chlorophyll contents, and reduced survival rates in comparison with the wild-type plants. In contrast, SAPK1- and SAPK2-overexpression lines had increased germination rates and reduced sensitivities to salt; including mild reductions in growth inhibition, reduced chlorosis, increased chlorophyll contents and improved survival rates in comparison with the wild-type plants. These results suggest that SAPK1 and SAPK2 may function collaboratively as positive regulators of salt stress tolerance at the germination and seedling stages. We also found that SAPK1 and SAPK2 affected the osmotic potential following salt stress by promoting the generation of osmotically active metabolites such as proline. SAPK1 and SAPK2 also improved reactive oxygen species (ROS) detoxification following salt stress by promoting the generation of ROS scavengers such as ascorbic acid, and by increasing the expression levels of proteins such as superoxide dismutase (SOD) and catalase (CAT). SAPK1 and SAPK2 may function collaboratively in reducing Na+ toxicity by affecting the Na+ distribution between roots and shoots, Na+ exclusion from the cytoplasm, and Na+ sequestration into the vacuoles. These effects may be facilitated through the expression of Na+-and K+-homeostasis-related genes. SAPK1 and SAPK2 may function collaboratively as positive regulators of salt stress tolerance at the germination and seedling stages in rice. SAPK1 and SAPK2 may be useful to improve salt tolerance in crop plants. Rice (Oryza sativa), is one of the most important cereal crops, and is the most sensitive of all cereal crops to salt stress, in particular, at the seedling and reproductive stages . Among the most common environmental stresses, salinity is a major constraint to plant growth and even mild salt stress can result in significant loss of productivity. Plants suffering from high salt stress often have a rapidly occurring osmotic stress and a more slowly forming ionic imbalance . Consequently, molecular damage and arrested growth occur, which ultimately reduce the crop yield. Salt stress is complex because it implies both ion toxicity and an osmotic component . High salt stress inhibits plant growth through both osmotic stress and ionic stress . Osmotic stress results in inhibition of water uptake, cell elongation, and leaf development. 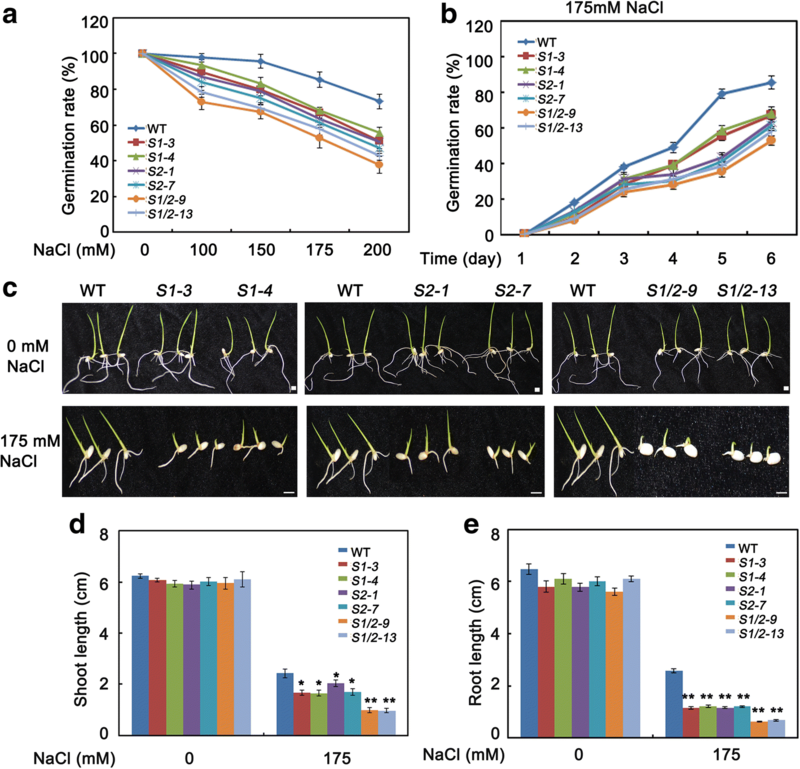 Ionic stress leads to high levels of Na+ accumulation in shoots; which decreases protein synthesis, enzymatic reactions and photosynthetic processes [2, 4, 5]. As a result, the production of reactive oxygen species (ROS) is increased, and ultimately the plant growth and biomass is reduced . With salt exposure, plants often display symptoms of Na+ toxicity due to Na+ accumulation. The main site of Na+ toxicity for many plants is the leaves, where photosynthesis and other metabolic processes occur [1, 7]. Therefore, reducing Na+ accumulation in the shoots - especially in the leaves - is important to protect plants from ionic Na+ stress [8, 9]. To reduce the toxic effects of Na+ accumulation, plants have mainly evolved two types of tolerance mechanisms. These are based on either limiting the entry of salt into the roots, or on controlling the salt concentration and distribution . Intracellular Na+ is exported out of the cell by the plasma membrane Na+/H+ antiporters salt overly sensitive (SOSs) pathway , or it is sequestered into the vacuole by tonoplast-localized Na+/H+ or K+/H+ exchangers (NHXs) . At the tissue level, regulation of Na+ loading into the root xylem is essential for limiting Na+ accumulation in the shoot . Many of the components related to the regulation of Na+ and K+ homeostasis in plants have already been characterized; including SOSs, NHXs, and high-affinity K+ transporters (HKTs) [13–15]. Phosphorylation is one of most important post-translational modifications; affecting activity, localization and stability of target proteins . Under salt stress, protein phosphorylation cascades are activated and play critical roles in rice salt tolerance [17, 18]. The sucrose non-fermenting-1-related protein kinase 2 family (SnRK2s) consists of ten members in both the Arabidopsis (SnRK2.1–10) and rice (known as osmotic stress/ABA-activated protein kinases, SAPK1–10) genomes. Based on their domain structures, they can be classified into subclasses I-III (Fig. 1) . Previous studies have confirmed that SnRK2s are involved in abscisic acid (ABA) and stress signaling pathways [19, 20]. Most of the rice and Arabidopsis SnRK2 kinases, with the exception of AtSnRK2.9, are activated by salt treatment [17, 21]; suggesting that they may have important roles in plant salt responses. In addition, several Arabidopsis (2.2, 2.3, 2.6, 2.7 and 2.8) and rice (SAPK8, SAPK9 and SAPK10) SnRK2 members are activated by ABA [17, 21]. These proteins are key regulators of the ABA signaling pathway; controlling seed development, dormancy and germination, seedling growth and stomata regulation in response to drought [22–24]. The Arabidopsis subclass II member SRK2C/SnRK2.8 positively regulates drought tolerance in roots , and also positively regulates metabolic processes associated with plant growth . Furthermore, overexpression of SRK2C/SnRK2.8 enhances drought tolerance  and plant growth  in Arabidopsis. However, Mizoguchi et al. reported that Arabidopsis snrk2.7, snrk2.8, and snrk2.7/2.8 mutants do not show any clear differences in survival or visible damage under drought stress in comparison with wild-type plants. In rice, overexpression of SAPK4 increases salt tolerance by altering the expression levels of ion homeostasis genes . Ectopic expression of SAPK6 (OSRK1) in tobacco reduces ABA sensitivity during seed germination and root elongation . Overexpression of SAPK6 (OSRK1) enhances root growth under salt stress through the phosphorylation of the ABF family in rice . Furthermore, SAPK9 positively regulates ABA-mediated drought stress signaling pathways in rice . Although there has been recent progress investigating the roles of the aforementioned members of SnRK2 subclasses I and III; in rice, our knowledge of the subclass II members is still limited. 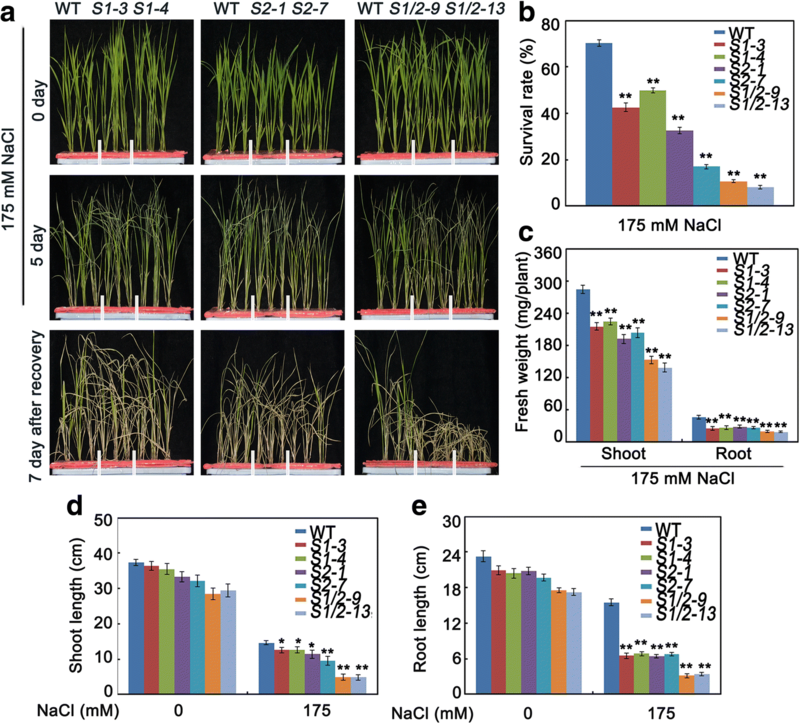 Previously, we reported that SAPK2, a subclass II member in rice, was strongly activated by drought and salt treatments . We also found that sapk2 mutants were more sensitive to drought stress than wild-type plants due to the up-regulation of numerous stress-inducible genes . Another member of subclass II, SAPK1, is strongly activated by high osmolarity, in a similar manner to SAPK2 . The kinase domains of SAPK1 and SAPK2 are highly conserved (92% amino acid identity). Therefore, these two subclass II members may regulate some overlapping signal transduction pathways. To date, the roles of SAPK1 and SAPK2 in salt tolerance in rice have not been characterized. In this study, we determined the functions of these proteins in response to salt stress using sapk1, sapk2 and sapk1/2 loss-of-function mutants (generated using the CRISPR/Cas9 system) and plants overexpressing these proteins (SAPK1-OE and SAPK2-OE). We analyzed the expression profiles of SAPK1 and SAPK2 and found that their expression levels were strongly induced by drought, NaCl, and PEG treatment, but not by ABA. In addition, SAPK2 expression was highest in the leaves, followed by the roots; whereas SAPK1 expression was highest in the roots, followed by the leaves. The localization patterns of SAPK1 and SAPK2 were similar in the cytoplasm and nucleus. Under salt stress, sapk1, sapk2 and sapk1/2 mutants (especially sapk1/2 mutants) exhibited reduced germination rates, severe growth inhibition, more advanced chlorosis, reduced chlorophyll contents, and reduced survival rates in comparison with the wild type. In contrast, SAPK1-OE and SAPK2-OE lines had increased germination rates, reduced salt sensitivities (including milder growth inhibition), increased chlorophyll contents, and increased survival rates in comparison with the wild type. Finally, we analyzed the effects of SAPK1 and SAPK2 on osmotic stress, ROS detoxification and Na+, K+ accumulation. Together, our results suggest that SAPK1 and SAPK2 may function collaboratively as positive regulators of salt stress tolerance at the germination and seedling stages in rice. SAPK1 and SAPK2 are rice SnRK2 II subfamily members. The open reading frame of SAPK1 consists of 1,029 bp and encodes a 342-amino acid polypeptide (LOC_Os03g27280). The open reading frame of SAPK2 consists of 1,020 bp and encodes a 339-amino acid polypeptide (LOC_Os07g42940). In our previous study, we showed that SAPK2 is induced by drought, NaCl, and PEG . To further clarify the roles of SAPK1 and SAPK2 in rice, we examined their expression profiles more precisely. First, we measured the induced expression of SAPK1 and SAPK2 in response to certain abiotic stresses using quantitative reverse transcription-PCR (qRT-PCR). SAPK1 and SAPK2 expression were both strongly up-regulated by drought, NaCl, and PEG treatment; but not by ABA treatment (Fig. 2A). These results show that SAPK1 and SAPK2 both respond to salt treatment and may be involved in responses to salinity stress. Next, we compared the SAPK1 and SAPK2 expression patterns in various tissues. To do this, we used qRT-PCR, and histochemical analysis of transgenic plants expressing the β-glucuronidase (GUS) gene driven by their own promoters. SAPK2 expression was highest in the leaves, followed by the roots; which is consistent with a previous study . In contrast, SAPK1 expression was highest in the roots, followed by the leaves (Fig. 2B). 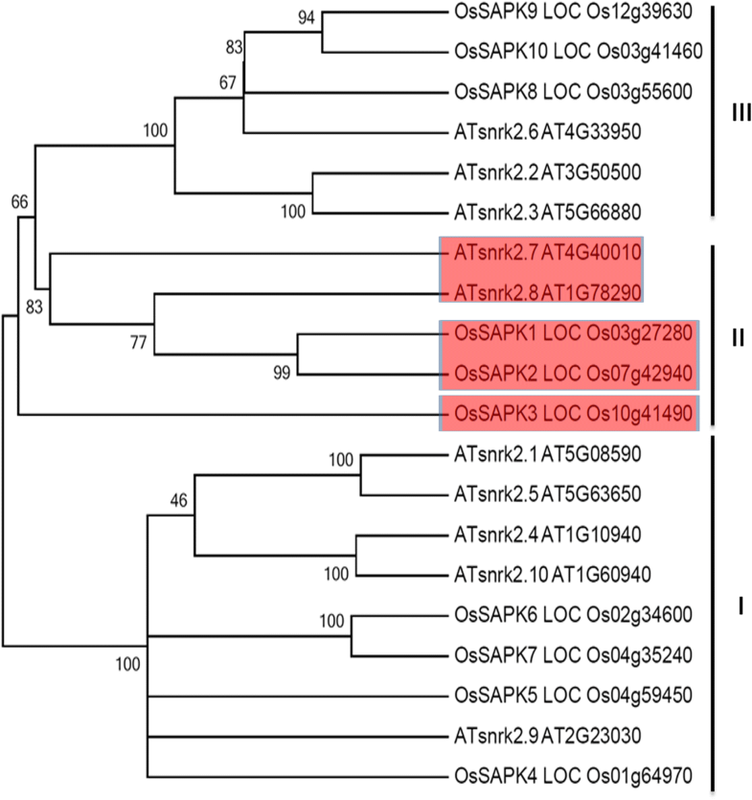 Histochemical analysis revealed the strongest SAPK2 expression was in the leaves, while the strongest SAPK1 expression was in the roots (Fig. 2C and D). We also examined the subcellular localization of SAPK1 and SAPK2 using fusions to green fluorescent protein (GFP) in tobacco mesophyll protoplasts (Fig. 2E). The localization patterns were similar in the cytoplasm and nucleus, and were analogous to those of the Arabidopsis subclass II SnRK2s SRK2C and SRK2F . Together, these results suggest that SAPK1 and SAPK2 have different tissue specificities, but they might be functionally collaboratively at the cellular level. 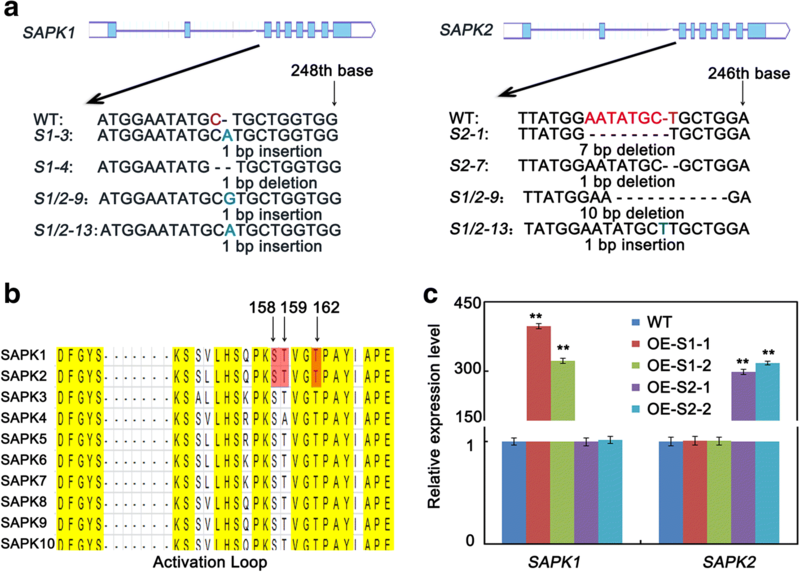 To further investigate the functions of SAPK1 and SAPK2 (Fig. 1a), we established sapk1 single mutants (sapk1–3 and sapk1–4); sapk2 single mutants (sapk2–1 and sapk2–7) and sapk1/2 double mutants (sapk1/2–9 and sapk 1/2–13) using the CRISPR/Cas9 system. Kobayashi et al. previously reported that Ser-158, Thr-159, and Thr-162 are essential for SAPK1 activity or activation (Fig. 3b). Because the kinase domains of SAPK1 and SAPK2 are highly conserved (92% amino acid identity), we predicted that Ser-158, Thr-159, and Thr-162 are also essential for SAPK2 activity or activation (Fig. 3b). The third coding exons of SAPK1 and SAPK2 were selected for guide RNA design. We determined that the SAPK1 and SAPK2 coding nucleotide sequences had frame shift mutations in the sapk1 and sapk2 single mutants and in the sapk1/2 double mutants. These mutations resulted in premature termination of the SAPK1 and SAPK2 amino acid sequences before Ser-158 (Fig. 3a). These results confirmed that the sapk1 and sapk2 single mutants and the sapk1/2 double mutants were non-functional. Seed germination is the most important phase during seedling establishment. However, salt stress is one of the most important factors limiting seed germination. To clarify the roles of SAPK1 and SAPK2 in salinity stress responses, we first compared the germination rate between the sapk1, sapk2 and sapk1/2 mutants and the wild type on an NaCl-containing medium. Under normal conditions, there were no significant differences in the germination rates between the mutants and the wild type (Fig. 4a). We then germinated the sapk1, sapk2, sapk1/2 and wild-type seeds on half-strength Murashige and Skoog (MS) agar medium supplemented with various concentrations of NaCl. The germination rates were calculated based on radicle emergence. As shown in Fig. 4a, on high-salt media (150, 175 or 200 mM NaCl), the germination of sapk1, sapk2 and sapk1/2 seeds were significantly inhibited in comparison with that of wild-type seeds. With 175 mM NaCl, approximately 34%, 39% and 48% of sapk1, sapk2 and sapk1/2 seeds, respectively, failed to germinate. These rates were significantly higher than that of the wild-type seeds (approximately 15%; Fig. 4b). These observations indicate that the sapk1, sapk2 and sapk1/2 mutants are more sensitive to salt stress than wild type during germination. Furthermore, they suggest that SAPK1 and SAPK2 are required for germination under salt stress, and may function collaboratively. Next, we evaluated the post-germination development of sapk1, sapk2 and sapk1/2 mutants and wild-type seedlings. As shown in Fig. 4(c, d and e), there were no significant difference in the shoot and root lengths between the mutants and the wild type without salt treatment. However, with 175 mM NaCl treatment, the shoot lengths of the sapk1 and sapk2 mutants (1.60–1.70 cm and 1.70–1.90 cm, respectively) were slightly shorter than those of the wild type (2.43 cm). Furthermore, the shoot lengths of the sapk1/2 double mutants (0.98 cm) were shorter in comparison with the sapk1 and sapk2 single mutants (Fig. 4c and d). In a root growth assay, the sapk1, sapk2 and sapk1/2 mutants were all more sensitive to salt treatment in comparison with the wild-type plants (Fig. 4c and e). The root lengths of the sapk1/2 double mutants (0.62 cm) were 50% of those of the sapk1 and sapk2 mutants (1.16 cm and 1.18 cm, respectively) and were 24% of the wild-type plants (2.59 cm) (Fig. 4c and e). Taken together, these results suggest that SAPK1 and SAPK2 have positive regulatory roles in salt stress responses and their functions are collaborative at the post-germination development stage. To further assess the roles of SAPK1 and SAPK2 in salt stress responses at the germination and post-germination stages, we generated transgenic rice expressing SAPK1 and SAPK2 under the control of the 35S promoter (OE-SAPK1–1, OE-SAPK1–2, OE-SAPK2–1, OE-SAPK2–2). We analyzed the expression levels of SAPK1 and SAPK2 in transgenic rice lines using qRT-PCR. We found that the expression levels of SAPK1 and SAPK2 in the SAPK1-OE and SAPK2-OE lines, respectively, were significantly higher than those of wild-type plants (Fig. 3c). Next, we analyzed the phenotypes of the SAPK1-OE and SAPK2-OE lines under salt stress. Without NaCl treatment, there were no significant differences in the germination rates and shoot and root lengths between the SAPK1-OE and SAPK2-OE lines and the wild type. With 175 mM NaCl treatment, the germination rates of the SAPK1-OE and SAPK2-OE lines were significantly higher than that of the wild type (Fig. 5a and b). With 200 mM NaCl, 20% and 18% of the SAPK1-OE and SAPK2-OE lines, respectively, failed to germinate. These rates were significantly lower than that of the wild type (44%; Fig. 5b). In a post-germination growth assay, the SAPK1-OE and SAPK2-OE lines exhibited less sensitivity to salt stress than the wild-type plants. The combined shoot and root lengths of the SAPK1-OE and SAPK2-OE lines (5.14 cm and 5.42 cm, respectively) were much longer than that of the wild-type plants (2.58 cm) (Fig. 5c-e). Together, these results further support the hypothesis that SAPK1 and SAPK2 have positive regulatory roles in salt stress responses at the germination and post-germination development stages. Salt stress usually inhibits plant growth at the seedling stage. To evaluate the physiological responses of sapk1, sapk2 and sapk1/2 mutants after salt stress, 4-week-old plants were exposed to half-strength liquid MS medium supplemented with 175 mM NaCl for 5 d. The survival rate was calculated after plants were allowed to recover in fresh half-strength liquid MS medium for 7 d. The survival rate of the sapk1/2double mutants (10%) was only 30% of those of sapk1 and sapk2 (30% and 40%, respectively) and was only 14% of that of the wild-type plants (70%; Fig. 6a and b). After treatment with NaCl for 5 d, salt stress caused more visible damage to sapk1, sapk2 and sapk1/2 mutants than to the wild-type plants, although both plants grew similarly without salt stress (Fig. 6a). Subsequent comparisons of the fresh weights and the lengths of shoots and roots between the mutants and the wild-type plants showed that the NaCl treatment substantially suppressed the growth of all the tissues tested (Fig. 6c, d and e). In the sapk1 and sapk2 mutants, the shoot fresh weights and shoot lengths were only 70% and 80% of those of the wild-type plants, respectively (Fig. 6c and d). However, the most severe damage was found in the roots, with the root fresh weights and root lengths about 60% and 40% of those of the wild-type plants, respectively (Fig. 6c and e). In the sapk1/2 mutants, shoot and root growth were severely affected. For example, the fresh weights of the shoot and the root were only 48% and 42% of those of the wild-type plants, respectively (Fig. 6c); and the lengths of the shoots and roots was 33% and 21% of those of the wild-type plants, respectively (Fig. 6d and e). Salt stress causes a significant reduction in the abundance of photosynthetic pigments in plants. The chlorophyll contents of ten seedlings exposed to salt stress were analyzed. Following salt treatment, the chlorophyll contents were greatly reduced in all the plants; however, the chlorophyll contents were most substantially reduced in the sapk1, sapk2 and sapk1/2 mutants than in the wild-type plants (Fig. 8a). This result follows a similar pattern to that found for survival rates. These results show that the mutations in sapk1, sapk2 and sapk1/2 obviously affect growth and salt tolerance at the seedling growth stage. To further confirm the roles of SAPK1 and SAPK2 in salt stress responses, we treated SAPK1-OE and SAPK2-OE transgenic plants with 175 mM NaCl. Four-week-old SAPK1-OE or SAPK2-OE plants were exposed to half-strength liquid MS medium supplemented with 175 mM NaCl for 7 d. The SAPK1-OE and SAPK2-OE plants had reduced sensitivity to salt stress, and had milder growth inhibition and chlorosis than the wild-type plants. The transgenic plants also had increased fresh weights, longer shoot and root lengths and higher chlorophyll contents (Fig. 7a, c, d, e and Fig. 8a). The survival rates of SAPK1-OE (about 36%) and SAPK2-OE (about 46%) were much higher than those of the wild-type plants (11%; Fig. 7a and b). Collectively, these observations further support the hypothesis that SAPK1 and SAPK2 function collaboratively as positive regulators of salt stress tolerance at the rice seedling stage. Accumulated free proline can stabilize subcellular structures and facilitate cell recovery from damage caused by abiotic stress . We compared the proline contents of the sapk1, sapk2 and sapk1/2 mutants, the SAPK1-OE and SAPK2-OE lines and the wild-type plants. No significant difference in proline contents were detected between each of the plant lines under normal conditions. However, under salt stress, the proline content was reduced in the sapk1, sapk2 and sapk1/2 mutants (especially in the sapk1/2 mutants) and was much higher in the SAPK1-OE and SAPK2-OE lines than in the wild-type plants (Fig. 8b). Proline biosynthesis is catalyzed by OsP5CS. According to our qRT-PCR data, the OsP5CS expression level was much lower in the sapk1, sapk2 and sapk1/2 mutants (especially in the sapk1/2 mutants) and was much higher in the SAPK1-OE and SAPK2-OE lines than in wild-type plants under salt stress conditions (Fig. 8h). 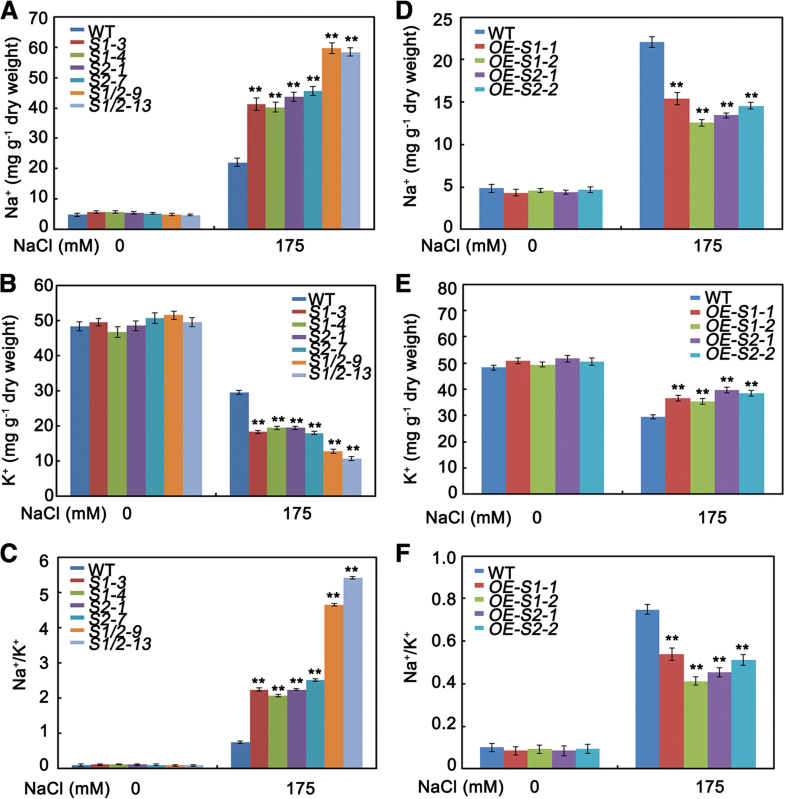 Taken together, these results suggest that SAPK1 and SAPK2 regulate salt stress responses by affecting the accumulation of compatible solutes such as proline. To investigate the degree of membrane peroxidation, we measured the relative electrolyte leakage and malondialdehyde (MDA) content under either normal or 175 mM NaCl conditions. 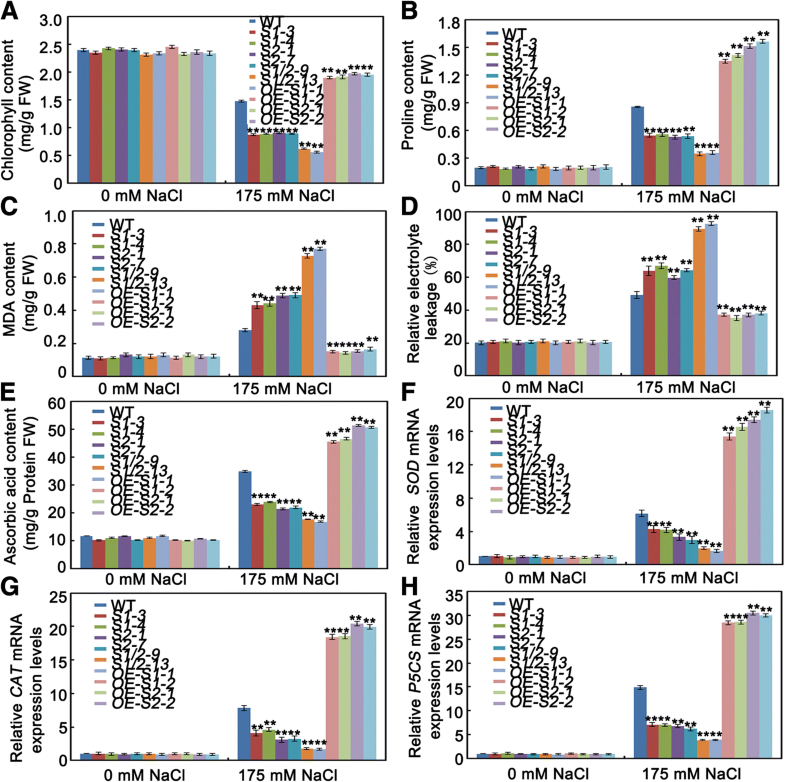 Without NaCl treatment, there were no differences in the relative electrolyte leakage and MDA contents between the sapk1, sapk2 and sapk1/2 mutants, the SAPK1-OE and SAPK2-OE lines and the wild-type plants (Fig. 8c and d). With 175 mM NaCl, the relative electrolyte leakage and MDA contents in the sapk1, sapk2 and sapk1/2 mutants were significantly higher than those of the wild-type plants. Moreover, the measurements from the sapk1/2 double mutants were much higher than those from the sapk1 and sapk2 single mutants (Fig. 8c and d). In contrast, the relative electrolyte leakage and MDA contents were significantly lower in the SAPK1-OE and SAPK2-OE lines than in the wild-type plants (Fig. 8c and d). Because MDA is the product of lipid peroxidation arising from ROS activity , we speculated that SAPK1 and SAPK2 affect salt tolerance via ROS detoxification. To investigate this hypothesis, we compared the ascorbic acid contents and the expression levels of superoxide dismutase (SOD) and catalase (CAT) between the sapk1, sapk2 and sapk1/2 mutants, the SAPK1-OE and SAPK2-OE lines, and the wild-type plants. As shown in Fig. 8(e–g), in the absence of salt treatment there were no significant differences in the ascorbic acid contents and SOD and CAT expression levels in any of the lines. With salt treatment, the ascorbic acid contents and SOD and CAT expression levels were significantly reduced in the sapk1, sapk2 and sapk1/2 mutants (especially in the sapk1/2 mutants) in comparison with the wild-type plants. In contrast, these parameters were significantly increased in the SAPK1-OE and SAPK2-OE lines. These results show that SAPK1 and SAPK2 function collaboratively in their ROS scavenging activity in response to salt stress at the seedling stage in rice. A low Na+ content and low Na+/K+ ratio in the cytoplasm are essential to maintain ion homeostasis under both normal and salt stress conditions. To determine whether SAPK1 and SAPK2 are involved in regulating ion homeostasis under salt stress, we determined the Na+ and K+ contents in the sapk1, sapk2 and sapk1/2 mutants, the SAPK1-OE and SAPK2-OE lines and in the wild-type plants. 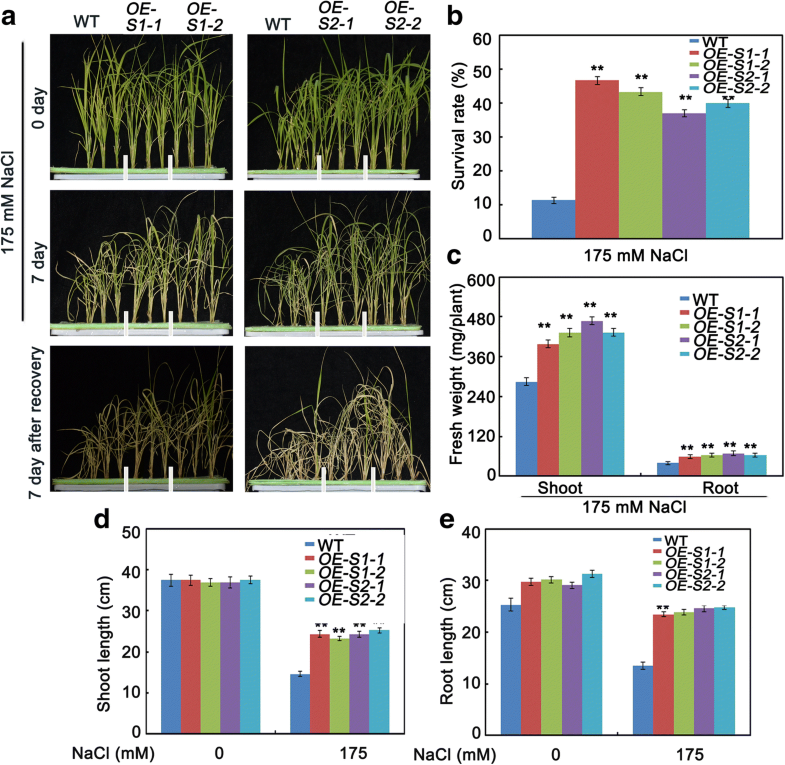 Rice plants were grown to 4 weeks and then treated with 175 mM NaCl for 5 d. Under normal conditions, the Na+ contents, K+ contents and the Na+/K+ ratios were similar between sapk1, sapk2, sapk1/2, SAPK1-OE, SAPK2-OE and the wild-type plants (Fig. 10a–f). Under salt stress, the K+ contents in the sapk1 and sapk2 mutants were significantly lower than that of the wild-type plants. The K+ contents in the sapk1/2 double mutants were much lower than those of the sapk1 or sapk2 single mutants (Fig. 9b). In contrast, the Na+ contents and Na+/K+ ratios in the sapk1 and sapk2 mutants were significantly higher than those of the wild-type plants, and the Na+ contents and Na+/K+ ratios in the sapk1/2 mutants were much higher than those of the sapk1 or sapk2 single mutants (Fig. 9a and c). In contrast, the SAPK1-OE and SAPK2-OE lines accumulated less Na+ and more K+, leading to a decreased Na+/K+ ratio in comparison with the wild type (Fig. 9d–f). Collectively, these observations suggest the possible roles of SAPK1 and SAPK2 in regulating Na+/K+ homeostasis under salt stress. Again, these roles appear to be collaborative. To further investigate the molecular roles of SAPK1 and SAPK2 in Na+ homeostasis, we analyzed the expression of OsSOS1, OsNHX1, OsHKT1;1 and OsHKT1;5 in seedlings leaves from the mutant and overexpression lines. As shown in Fig. 10, under salt treatment, the expression levels of OsSOS1, OsNHX1, OsHKT1;1 and OsHKT1;5 were significantly reduced in the sapk1, sapk2 and sapk1/2 mutants. Expression levels of these genes were significantly increased in the SAPK1-OE and SAPK2-OE lines in comparison with the wild-type plants. These results show that SAPK1 and SAPK2 are involved in modulating the transcription of OsSOS1, OsNHX1, OsHKT1;1 and OsHKT1;5. SnRK2s are key molecules that unify different abiotic stress signals in plants . Therefore, research on the function of the SnRK2s is meaningful to fully understand the mechanisms of abiotic stress responses in plants. Until now, no data on salt tolerance in SAPK gene knockouts in rice have been presented. To fully understand the roles of SAPK1 and SAPK2 in the salt-resistance mechanism, elucidation of their tissue specificities and analysis of mutants is crucial. To address these criteria, we generated the loss-of-function mutants such as sapk1, sapk2 and sapk1/2, and the overexpression lines SAPK1-OE and SAPK2-OE. In Arabidopsis, SnRK2.7 and SnRK2.8 are strongly activated by salt stress and weakly activated by ABA to regulate drought tolerance and plant growth [21, 25, 26]. SnRK2.8 is expressed abundantly in roots and weakly in leaves, whereas SnRK2.7 is expressed in roots, leaves and flowers . SnRK2.8 and SnRK2.7 localize to the cytoplasm and nucleus . SAPK1 and SAPK2 are rice SnRK2 II subfamily members and are homologous genes of SnRK2.7 and SnRK2.8 (Fig. 1). SAPK1 and SAPK2 are activated by salt treatment but not by ABA , suggesting that they may have important functions in plant salt responses. Our data showed that SAPK1 and SAPK2 expression were strongly induced by drought, NaCl, and PEG treatment, but not ABA (Fig. 2A). In addition, the highest SAPK2 expression was in the leaves, followed by the roots; whereas SAPK1 expression was highest in the roots, followed by the leaves (Fig. 2B). SAPK1 and SAPK2 were distributed in the nucleus and cytoplasm. Together, these results suggest that SAPK1 and SAPK2 may function in a different manner from SnRK2.7 and SnRK2.8. Salt stress is particularly detrimental during germination and seedling growth. Slower growth is an adaptive feature for plant survival under salt stress because it allows plants to rely on multiple resources to combat stress . Salt stress, like many other abiotic stresses, inhibits plant growth, resulting in a considerable reduction in the fresh weights of leaves, stems, and roots [35, 36]. Firstly, we characterized the sensitivity to salt stress of the sapk1, sapk2 and sapk1/2 mutants during the germination and post-germination stages. All mutants, especially the sapk1/2 mutants, exhibited lower germination rates than the wild-type plants (Fig. 4a and b). In contrast, the SAPK1-OE and SAPK2-OE plants exhibited higher germination rates than those of the wild type (Fig. 5a and b). 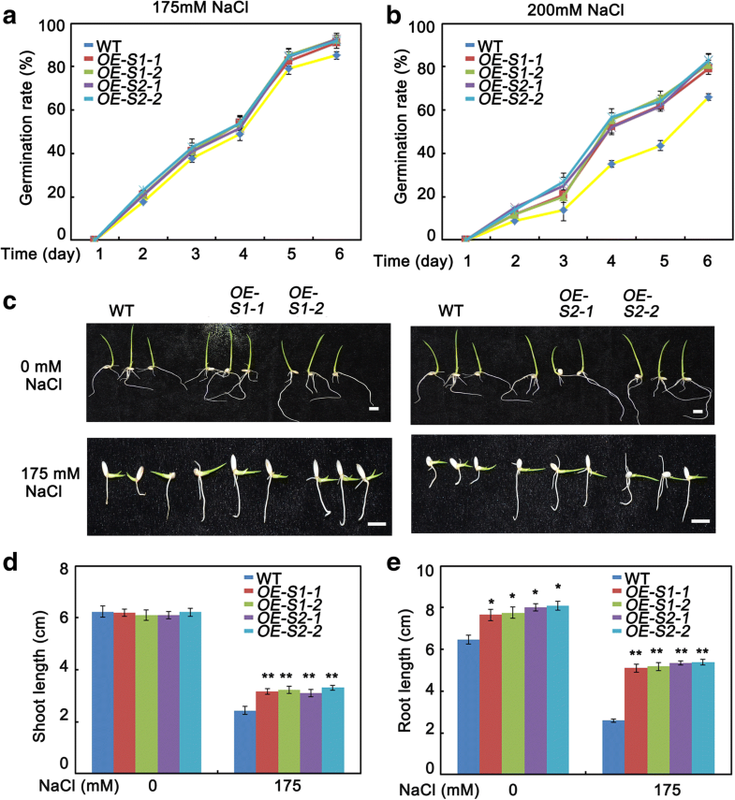 At the post germination stage, all mutants (especially the sapk1/2 mutants) exhibited reduced shoot and root lengths than the wild-type plants (Fig. 4c–e). The SAPK1-OE and SAPK2-OE plants exhibited longer shoot and root lengths than the wild-type plants (Fig. 5c–e). Next, we investigated the effects of SAPK1 and SAPK2 on growth at the seedling stage. Our phenotype analyses showed that, with salt treatment, the sapk1, sapk2 and sapk1/2 mutants had more severe growth inhibition, developed chlorosis, and had reduced survival rates in comparison with the wild type (Fig. 6a–e). In contrast, the SAPK1-OE and SAPK2-OE plants had reduced sensitivity to salt and had higher survival rates in comparison with the wild type (Fig. 7a–e). Salt may affect plant growth indirectly by reducing photosynthesis . The significantly lower chlorophyll contents in the sapk1, sapk2 and sapk1/2 mutants, and the higher chlorophyll contents in the SAPK1-OE and SAPK2-OE lines in comparison with the wild-type plants supports this hypothesis (Fig. 8a and b). Together, these results indicate that SAPK1 and SAPK2 increase rice survival rates by reducing growth inhibition and leaf chlorosis. Therefore, these proteins may function collaboratively as positive regulators of salt stress tolerance at the germination, post germination and seedling stages. High concentrations of salt always induce osmotic stress . The most immediate event following salt-induced osmotic stress is the loss of turgor pressure, resulting from changes in cell structure and membrane leakage . Under salt stress, plants lower the osmotic potential by generating osmotically active metabolites such as proline, sugars, and sugar alcohols . All osmolytes have the common characteristic of lowering the osmotic potential in the cytosolic compartment at relatively high concentrations without inhibiting metabolic reactions . In the proline content analyses, we found that the proline contents under drought stress was significantly lower in the sapk1, sapk2 and sapk1/2 mutants, and much higher in the SAPK1-OE and SAPK2-OE lines than in wild-type plants (Fig. 8c and d). The OsP5CS expression levels were in accord with these results. These results suggest that SAPK1 and SAPK2 affect the generation of osmotically active metabolites such as proline. This response to salt stress at the seedling stage is predicted to reduce the osmotic stress and cell structure and membrane damage. Salt tolerance in rice appears to correlate with the ability to scavenge reactive oxygen . Salt stress also leads to increased ROS production. Plants cope with reactive oxygen stress by increasing the enzymatic and non-enzymatic scavenging activity of ROS [42, 43]. One of the non-enzymatic scavengers of reactive oxygen is ascorbic acid, while enzymatic scavengers include SOD and CAT. With salt treatment, the ascorbic acid contents and the SOD and CAT expression levels were significantly reduced in the sapk1 and sapk2 mutants, and especially in the sapk1/2 mutants. These scavengers were significantly increased in the SAPK1-OE and SAPK2-OE lines in comparison with the wild-type plants (Fig. 8e–g). Moreover, the MDA contents and the relative electrolyte leakage levels were significantly higher in all mutants and were significantly lower in the SAPK1-OE and SAPK2-OE lines (Fig. 8c and d) in comparison with the wild type. MDA is a product of lipid peroxidation that arises from ROS activity, and is a stress-specific molecular marker that indicates the extent of cellular damage . The most immediate event following salt-induced osmotic stress is the loss of turgor pressure, which due to changes in cell structure, different compositions of cell membranes and membrane leakage [44, 45]. Our results suggest that SAPK1 and SAPK2 protect plants from oxidative damage during salt stress by increasing the ascorbic acid content and SOD and CAT expression levels to enhance ROS detoxification. In plants, K+ is an essential nutrient. K+ is also essential for enzyme activities and ionic homeostasis [46, 47]. Because Na+ inhibits many enzymes, it is important to prevent Na+ accumulating to a high level. When a high salt concentration is rapidly applied, NaCl shock leads to a rapid osmotic challenge, followed more slowly by accumulation of Na+. We analyzed the Na+ and K+ contents and the Na+/K+ ratio after a high salt concentration was applied. As shown in Fig. 9, the sapk1, sapk2 and sapk1/2 mutants, especially the sapk1/2 mutants, accumulated more Na+ and less K+, leading to a higher Na+/K+ ratio in comparison with the wild type (Fig. 9a–c). In contrast, the SAPK1-OE lines and SAPK2-OE lines accumulated less Na+ and more K+, leading to a lower Na+/K+ ratio in comparison with the wild type (Fig. 9d–f). These observations suggest that SAPK1 and SAPK2 are probably involved in regulating Na+/K+ homeostasis under salt stress, and that their functions are collaborative. Many of the components associated with the regulation of Na+ and K+ homeostasis have been characterized. Our qRT-PCR results showed that the expression levels of OsSOS1, OsNHX1, OsHKT1;1 and OsHKT1;5 were significantly reduced in the sapk1, sapk2 and sapk1/2 mutants, and were significantly increased in the SAPK1-OE lines and SAPK2-OE lines, in comparison with wild-type plants (Fig. 10a-d). The OsSOS1 gene encodes a rice plasma membrane Na+/H+ exchanger that extrudes Na+ from the cortex cells at the root-soil interface, thereby reducing the net uptake of Na+ . The reduced levels of OsSOS1 transcript and the increased Na+ accumulation in the leaves of the sapk1, sapk2 and sapk1/2 mutants suggest that the decreased tolerance to salt in these plants is caused by extruding Na+ from the cortex cells. OsNHX1 is essential for Na+ detoxification through Na+ sequestration into the vacuole [12, 49]. The reduced OsNHX1 transcript levels in the sapk1, sapk2 and sapk1/2 mutants suggest that SAPK1 and SAPK2 affect the sequestration of Na+ in leaf cells. Members of the subfamily I HKT transporters are thought to mediate Na+ influx into root cells and to regulate the Na+ distribution between roots and shoots [15, 50–52]. OsHKT1;1, which is mainly expressed in the phloem of the leaf blades and was localized in plasma membrane in rice, plays an important role in reducing Na+ accumulation in shoots to cope with salt stress . 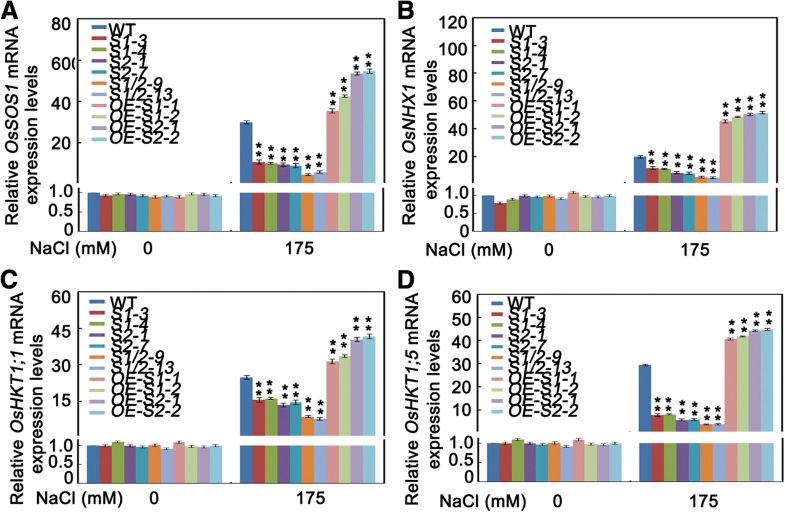 OsHKT1;5 (OsSKC1/HKT8) participates in reabsorption of Na+ at the xylem parenchyma, thereby restricting the buildup of toxic concentrations of Na+ in photosynthetic tissues . 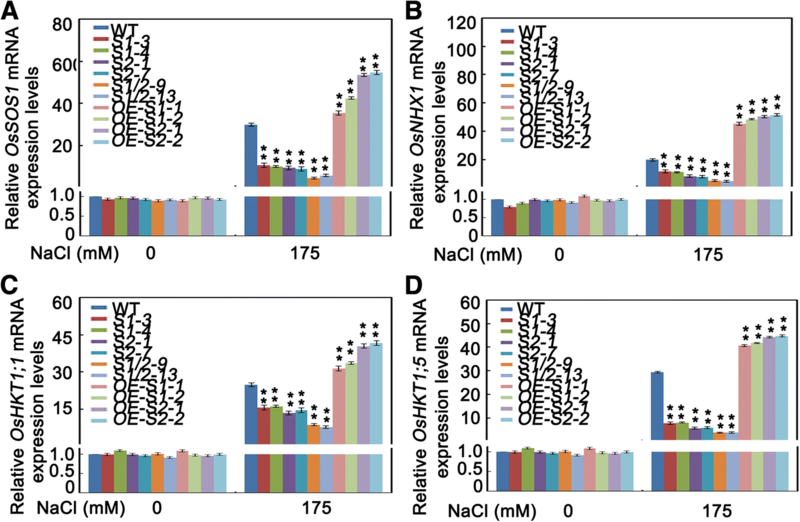 The reduced expression levels of OsHKT1;1 and OsHKT1;5 and increased Na+ accumulation in the leaves of the sapk1, sapk2 and sapk1/2 mutants suggests that the decreased tolerance to salt in these plants was caused by changes in the Na+ distribution between roots and shoots. Together, these results suggest that SAPK1 and SAPK2 may function collaboratively in reducing Na+ toxicity by affecting the Na+ distribution between roots and shoots, Na+ exclusion from the cell cytoplasm, and Na+ sequestration into the vacuoles. These processes may occur by SAPK1 and SAPK2 regulating the expression levels of the Na+- and K+- homeostasis related genes OsSOS1, OsNHX1, OsHKT1;1 and OsHKT1;5. In this study, we have characterized the biochemical and physiological responses to salt stress of two rice subclass II SnRK2s, SAPK1 and SAPK2. To do this, we developed loss-of-function mutants (using the CRISPR/Cas9 system) and transgenic plants overexpressing SAPK1 and SAPK2. Expression profiling revealed that SAPK1 and SAPK2 expression were strongly induced by drought, NaCl, and PEG treatments, but not by ABA. In addition, the SAPK2 expression level was highest in the leaves, followed by the roots; whereas the SAPK1 expression level was highest in the roots, followed by the leaves. Both proteins were localized to the nucleus and cytoplasm. In phenotypic resistance analyses of salt stress, the sapk1, sapk2 and sapk1/2 mutants (especially the sapk1/2 mutants) had reduced germination rates, increased growth inhibition, developed chlorosis, and had reduced survival rates in comparison with the wild type. In contrast, the SAPK1-OE and SAPK2-OE plants exhibited increased germination rates, reduced sensitivity, and increased survival in comparison with the wild type. These results suggest that SAPK1 and SAPK2 may function collaboratively as positive regulators of salt stress tolerance at the germination and seedling stages. Further study suggested that SAPK1 and SAPK2 affect osmotic stress and ROS detoxification in the salt stress response. SAPK1 and SAPK2 promote the generation of osmotically active metabolites such as proline, ROS scavengers such as ascorbic acid, as well as increased SOD and CAT expression. SAPK1 and SAPK2 may function collaboratively in reducing Na+ toxicity by affecting the Na+ distribution between the roots and shoots, excluding Na+ from the cytoplasm of cells, and sequestering Na+ into the vacuoles. These processes may occur via regulation of the expression of the Na+- and K+-homeostasis related genes OsSOS1, OsNHX1, OsHKT1;1 and OsHKT1;5. Mutant lines of sapk1, sapk2 and sapk1/2, overexpression lines of SAPK1 and SAPK2 and wide type plants were selected for the experimental works. All the experiments were performed using the seeds of same conditions. The sterilized seeds from different genotypes were germinated on half-strength Murashige and Skoog (MS) medium simultaneously and kept in growth chamber at 28 °C under long-day conditions (14 h light/10 h dark cycles). After 3 days germination, seedlings were transferred into half-strength liquid medium. We employed the CRISPR/Cas9 system to generate sapk1, sapk2 and sapk1/2 mutants. The CRISPR/Cas9 plasmid was designed according to the protocol described previously . Concisely, the third coding exons of SAPK1, SAPK2 were selected for guide RNA design. The single target site was inserted between OsU3 and sgRNA in the pYLsgRNA-OsU3 vector, and then the OsU3-sgRNA cassette was cloned into the pMH-SA vector . For the double editing of SAPK1 and SAPK2, a tandem combination of OsU3-sgRNA (for SAPK1) and OsU6a-sgRNA (for SAPK2) was cloned into the pMH-SA vector. For mutation detection, genomic DNA extracted from mutant seedlings (all plant) were used for PCR. Then PCR products were identified by comparing gRNA target sequences of SAPK1 (atggaatatgctgctggtgg) and SAPK2 (tagttatggaatatgctgc) to the rice reference genome . In T0 generation, we collected 20 hygromycin-resistant plants for each gene. Based on mutation detection results, we identified two independent homozygous mutant lines for each gene in the T1 generation, which we named sapk1–3, sapk1–4, sapk2–1, sapk2–7, sapk1/2–9 and sapk1/2–13. The primers used for CRISPR/Cas9 (U3-SAPK1-F, U3-SAPK1-R, U3-SAPK2-F and U3-SAPK2-R) and mutation detection (SAPK1-u3-F, SAPK2-u3-R, SAPK2-u3-F and SAPK2-u3-R) were listed in Additional file 1. To generate the SAPK1 and SAPK2 overexpression transgenic plants, the full-length cDNA of SAPK1 and SAPK2 was cloned into the p1301 vector in the sense orientation behind the CaMV 35S promoter. Rice (Oryza sativa L. japonica.) was used for transformation. To detect the transcript levels of target genes under different stresses, wide type plants were grown in the same condition for 4 weeks. RNA extraction and qRT-PCR analysis followed the method of Lou et al. . Gene-specific primers used in qRT-PCR analysis were listed in Additional file 1. For GUS reporter analysis, the putative promoters of SAPK1 and SAPK2 were amplified from genomic DNA using primers Promoter-SAPK1-F, Promoter-SAPK1-R and Promoter-SAPK2-F, Promoter-SAPK2-R (Additional file 1). The fused ProSAPK1-GUS and ProSAPK2-GUS was cloned into the p1300 vector. GUS staining was detected as described . The full-length SAPK1 and SAPK2 CDS sequences were inserted into P30 to generate green fluorescent protein (GFP) fusion protein. The fusion constructs were employed for the transfection of Nicotiana benthamiana. GFP fluorescence was observed using a confocal laser scanning microscope (Olympus, http://www.olympus-global.com). To test seed germination, seeds from different genotypes were surface-sterilized. Then sterilized seeds were planted on half-strength MS agar medium containing 0, 100, 150, 175, 200 mM NaCl. The germination rates were assessed at designated time. To test the growth performance at post-germination stage, the seeds of different genotypes were germinated on half-strength MS agar medium simultaneously. After 3 days, the seedlings were transferred to half-strength MS agar medium supplemented with 175 mM NaCl for further growth. Twenty seedlings were used to measure shoot and root length. All these experiments were repeated three times, with 30 seeds per sample. The sterilized seeds of different genotypes germinated on half-strength MS medium simultaneously for 3 days. Seedlings were then transplanted in half-strength liquid MS medium for 4 weeks. For NaCl tolerance assays, Seedlings were then transferred into half-strength MS liquid medium supplemented with 175 mM NaCl for 5 days (groups of SAPK1-OE and SAPK2-OE lines for 7 days). After treatment, the seedlings were transferred into fresh half-strength MS liquid medium to recover for 7 days. The 4-week-old seedlings of different genotypes treated with 175 mM NaCl for 5 days. Then relative ion leakage and the content chlorophyll, Proline, MDA and ascorbic acid were analyzed. The relative electrolyte leakage was checked following the method of Lou et al. . The conductance of H2O was measured by conductivity meter (HORIBA TWIN COND B-173). Chlorophyll was extracted with 80% acetone from leaves of salt-treated plants. Chlorophyll content was determined at 663 nm and 645 nm according to the method described by Lichtenthaler . The content of free proline in leaves was estimated as described . And the absorbance at 520 nm was measured by spectrophotometer. L-Pro was used as a standard to calculate the proline concentration. The content of MDA in leaves was detected as described . And the absorbance at 532 nm was measured by spectrophotometer. The MDA content was expressed as nmol g− 1 FW. The content of ascorbic acid was detected using commercial assay kits purchased from Nanjing Jiancheng Bioengineering Institute (Nanjing, China). And the absorbance at 536 nm was measured. Ion content in rice leaves was measured as described previously  with minor modifications. Briefly, 4-weeks-old plants were treated with 175 mM NaCl and allowed to grow for 5 days. Leaves were harvested. Then ion content was determined using an inductively coupled plasma optical emission spectrometer (ICP-OES) (SPS3100, SII Nano Technology Inc., Japan). For the above assays, consistent results were obtained from at least three experiments, and the result from one experimental was exhibited here. Average of three replicates was calculated to represent each data point. Excel 2010 was used for making charts. Significant difference among different treatments was identified by an analysis of variance by using SigmaPlot10.0. The data represent mean ± standard error (SE) of three independent experiments. We thank Shelley Robison, PhD, from Liwen Bianji, Edanz Group China (www.liwenbianji.cn/ac), for editing the English text of a draft of this manuscript. This work was supported by NSFC-the United Fund of Yunnan Province. (U1702231), the Strategic Priority Research Program of the Chinese Academy of Sciences (Class A) (XDA08020203), the Youth Innovation Promotion Association CAS (to Houping Wang), the Botanical Society of China (Early Career Fellowship to Houping Wang), the CAS “Light of West China” Program (to Houping Wang). LDJ, YDQ designed the experiments, LDJ performed the experiments and wrote the manuscript, LDJ, WHP analyzed the data and edited the article. All authors read and approved the final article.